There was to be no fairy-tale return to the Sixways Stadium for Doncaster Knights’ director of rugby Clive Griffiths. The Welshman, who enjoyed a spell as the Worcester Warriors No 2 nearly a decade ago, saw his former club inflict a ninth successive league defeat (25-5) on his current club. Griffiths acknowledged in the build-up that Knights had it all to do if they were to become the first side to beat the Warriors at home this season. But, encouraged by the fact that Jersey had come away from Sixways with a losing bonus point, he felt Knights weren’t without hope and they certainly gave it their best shot. For over an hour Knights, who went close to levelling the scores on the stroke of half-time when being held up over the line, entertained realistic hopes of leaving Sixways with something to show for their efforts. Indeed, trailing by just 5-0 at the start of the final quarter with the blustery wind at their backs, a win wasn’t beyond them though they had been on the back-foot for long periods in the third quarter. But not for the first time this season, Knights contributed to their downfall by having a man sin-binned at a crucial stage of a game. 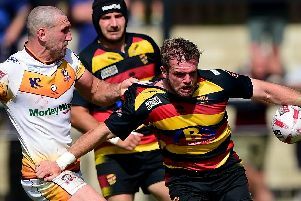 The last thing Knights, who had rode their luck on a couple of occasions, needed was to have centre Bevon Armitage yellow-carded on 64 minutes. Flanker Sam Betty touched down from the subsequent catch and drive to make it 10-0. But with Ryan Lamb again failing to convert, Knights were only a successful penalty goal from a losing bonus point. Any comeback hopes they may have entertained at that stage, however, were effectively dashed when wing Tom Biggs scored out wide on 69 minutes. Betty and prop Mike Daniels, who amazingly raced over 60 metres following an interception, made victory look easier than it was. Clark, who only made his return off the bench after over three months on the sidelines the week before, had come on for fly-half Piers Francis – one of three injured Doncaster players to come off just before the break. With Paul Jarvis joining injured half-back Bruno Bravo and Latu Makaafi – both try-scorers against Munster A – on the sidelines following his late cry-off ,Knights gave a debut to Ume Fosita at full-back. WORCESTER: Howard, Hammond, Stelling, Symons, Biggs, Lamb, Arr; Bower, Creevy, Schonert, Williams, Thomas, Senature, Betty, Van Velze. Rep: George, Porter, Daniels, Sanderson, Mulchrone, Mieres, Grove. Knights: Fosita, Flockhart, Bulumakau, Armitage, Lewis, Francis, Maplesden; :List, Hunter, Quigley, Hotson, Phelan, Challinor, Hills, Shaw. Rep: Bergmanas, Veikioso, Ross Davies, Eggleshaw, Clark, Foden, Hoadley.